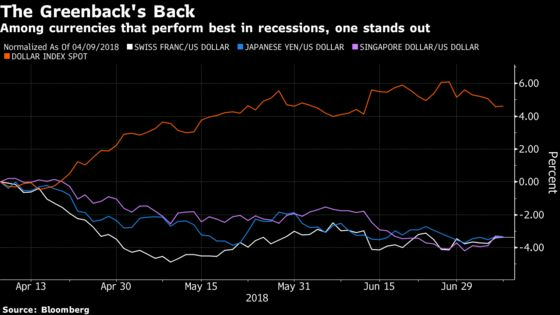 (Bloomberg) -- If a U.S. or global recession is looming, it’s time to own the Swiss franc, Singapore dollar, U.S. dollar and Japanese yen -- and ditch emerging market currencies, according to analysts from JPMorgan Chase & Co.
JPMorgan drew on research of currency performance over the last five recessions. While the yen historically had less impressive performance than the other three key hedges, this time around its real effective exchange rate -- a measure that adjusts for relative inflation and trade flows -- is 23 percent below its 40-year average. Ahead of the last three recessions, it was 8 percent overvalued, the bank calculated. That means Japan’s currency should “form a central part of any recessionary hedge,” the strategists wrote. JPMorgan forecasts the yen to appreciate to 108 per dollar in September and 106 in December. It was at 110.51 as of 6:06 p.m. in Tokyo.